Cricket Switzerland, with its registered home in the Swiss capital of Bern, is the premier cricket body for cricket in Switzerland and is recognised by the International Cricket Council (ICC). Cricket Switzerland organises a 40 over domestic league, a T20 competition, selects & organises senior & junior international squads and arranges coaching & training courses throughout Switzerland through the two spin-off associations: the Swiss Federation Of Cricket Umpires & Scorers (swisssFOCUS) and the Cricket Coaches Association of Switzerland (CCAS). Cricket is played professionally in Australia, Bangladesh, England, India, Kenya, New Zealand, Pakistan, South Africa, Sri Lanka, West Indies & Zimbabwe. Closer to home it is played as an amateur sport in every almost every European country and of course in Switzerland by 450 registered senior and 650+ junior cricketers in twenty-three clubs and six schools. There are also over 45 coaches, 30 umpires and an additional estimated 1,200 passive members. Cricketers come from all over Switzerland. They are typically bi-lingual, multiple cultural aware, enjoy an above average schooling and subsequently above average income. Cricket is played on public sports fields and school grounds with an artificial pitch. Thanks to the support of local sports councils, Basel, C.E.R.N., Cossonay, Geneva & Winterthur have permanent NottsSport© surfaces. Swiss junior cricket offers youngsters the opportunity to spend their free time being healthy & active, to interact constructively with their peer groups, and to meet with others from a variety of cultures, encouraging tolerance in a multi-culturalasociety. From the humble beginning of just a handful of enthusiastic juniors in 2005, some 650+ youngsters aged between 6-17 years of age now play cricket under the umbrella of Cricket Switzerland's Youth Development scheme. 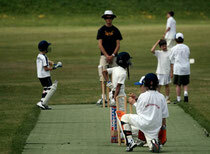 The success of the youth cricket movement is spreading fast with numbers growing year by year. Youth cricket in Switzerland has spread throughout the country, and leagues now are played between the regions at Under 11, 13, 15 and 17 levels. The sport has already reached out into several international and local schools and proved a big hit with pupils – both boys and girls, allowing the steady integration of local youngsters into a sport unfamiliar in Switzerland. For their part, Swiss parents are happy to see their sons and daughters indulging in a sport that lacks the hostile edge of football and ice hockey. In addition, their children mix with others from different ethnic backgrounds and learn better English language skills in1the1process. Expatriate parents are also delighted to find a thriving youth cricket scene in Switzerland that helps smooth the family transition from their home countries by supplying a familiar outlet for their1children. The spread of the game has been assisted by enthusiastic parents’ participation in ECB coaching courses. Dozens of qualified coaches are turning up week after week to encourage and hone the skills of future Swiss cricketers, with more coaching programmes planned. The rapid strides being made in Swiss youth cricket has not gone unnoticed by the game’s governing body – the International Cricket Council (ICC). Several European awards have already been received by the country’s enthusiastic organisers. What Cricket Switzerland can do in return for an investment in cricket in Switzerland.